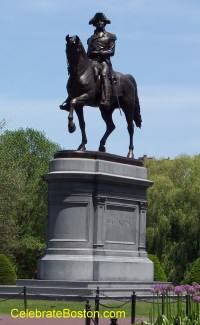 "The colossal equestrian bronze statue of George Washington, in the Public Garden, at the Arlington Street entrance opposite Commonwealth Avenue, is the largest and one of the most impressive works of sculpture in Boston. The funds for this statue were raised by subscription (donations), and by a great fair in 1859. The movement began in the spring of that year, and the first substantial contribution to the fund was from the receipts of an oration by Robert C. Winthrop, given at the Music Hall (today's Orpheum Theatre). The great fair for its benefit was held in November. The city appropriated $10,000; and $5,000 of the surplus of the Edward Everett statue fund, given after the completion of that work, had brought the fund up to the required amount. A contract was made with Boston artist Thomas Ball, who erected his model in a studio in the rear of Chickering’s Piano Factory (the building still stands at 791 Tremont Street near Mass Ave). In four years it was completed; but, due to the Civil War and shortages of bronze, the casting of the statue was deferred for some years, when it was finally accomplished by the Ames Company in Chicopee, MA. This difficult piece of work was so admirably done that it compares well with the work of the celebrated Royal (old) Foundery at Munich. The statue represents Washington at the time of middle life, and the countenance and attitude are full of force and vigor. It faces to the south. The lines, both of horse and rider, are graceful and natural. The location of the statue is most attractive. It is placed in the midst of one of the finest thoroughfares of the Garden, handsomely enclosed, and surrounded by beautiful flower beds. It was placed into position and unveiled on July 3, 1869, with former Mayor Alexander Rice making an address on the occasion. The speech was also regarded as a matter for congratulation, as all the work upon the statue and its support was done by Massachusetts artists and artisans. The height of the statue is 22 feet, and the fine granite pedestal 16 feet; so that, with its pedestal, it reaches 38 feet in total. The foundation is of solid masonry, resting on piles 11 feet deep. The noted sculptor T. H. Bartlett of that time pronounced the work to be "the most important and best specimen of monumental decoration in New England." "The horse," he said, "has a personality; its ears being thrown forward, the eyes and action of the head indicating that he is attracted by some object. Such a personality is an essential quality in a composition like this...It is said that the rider does not sit well; that though the horse is intended to move, he has no motion; that the action of the hand holding the bridle is not worthy of its occupation, and that the action of the right hand is too frivolous. Whatever may be said against this statue from the standpoint of the great equestrian statues of the world, it is certain, that as time goes on, and the circumstances surrounding its production are fully understood, it will lose neither interest or admiration." Derived from Bacon's Dictionary of Boston (1886).